The Christmas Creep–it comes earlier every year! In our local stores Christmas decorations are already out, right next to the Halloween candy. It seems like the push to extend the Christmas shopping season always gets stronger. We know the reason for the season, but sometimes the gift lists and party obligations can put us on edge and cloud our vision. If we’re going to observe Christmas and not be a harried, addled mess, we’ll need to prepare ahead of time. Gifts already purchased, parties planned. But is there something more? Some other way to prepare our hearts to celebrate the coming of Immanuel, God with us? Many church traditions celebrate Advent during the month of December, a time of fasting before the feast of Christmas. Families sometimes celebrate together with a simple devotional. Natasha Metzler has written a brand new storybook called Christmas: The Whole Story of the God Who Loves. It’s an illustrated book of devotionals to share together. Each day through the 25 days before Christmas, Natasha uses a story from the Bible to tell of the coming Savior. We begin at Creation and travel through the Old Testament stories of The Fall, The Exodus, Rahab, Ruth, and David, the to Zechariah and Elizabeth and finally to Joseph and Mary. I really like that these daily readings are quite short. This isn’t an extensive study to try to add in around the edges of already packed days. The stories would be perfect to read over breakfast or as you were tucking a child in at night. The images created by Brianna Siegrist beautifully illustrate the themes and stories. And there’s even a little green bug to spot in each picture–that was our favorite part! The noisy message from our culture often seems to say that if we want to be happy at Christmas, all we need to do is buy more. 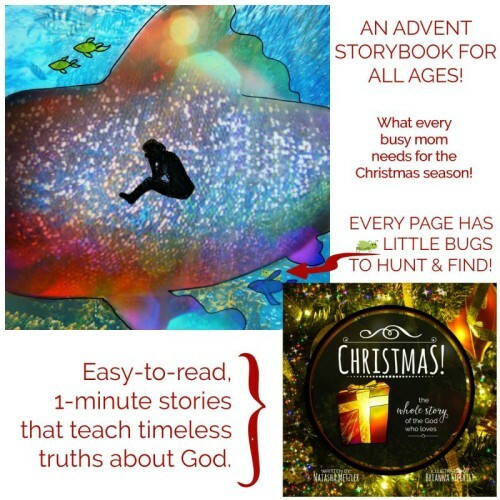 But if you’re looking for a way to invite your children to come away where you can hear the quiet voice of the Spirit, Christmas: The Whole Story of the God Who Loves by Natasha Metzler is a wonderful resource. If you’d like to learn more about how my family celebrates the season of Advent, I invite you to sign up for my email list. Then I’ll send you a free copy of my book Keeping Advent! Kortney Garrison lives with her family in the Pacific Northwest. Her days are filled with stories and poems, nature walks, drawing, and pots of tea. She writes about homeschooling through the church year at One Deep Drawer. Thank you so much for your kind review! I’m so glad you enjoyed it. Thanks so much for sharing your work with us!